At the end of Prohibition, a bootlegger (Edward G. Robinson) goes legit but struggles to sell his awful-tasting beer. As his business tanks, he goes more and more into debt, and soon owes nearly half a million dollars. Meanwhile, his daughter (Jane Bryan) becomes engaged to a state trooper (Willard Parker), and he must deal with four dead bodies that show up in his summer house after a local heist. 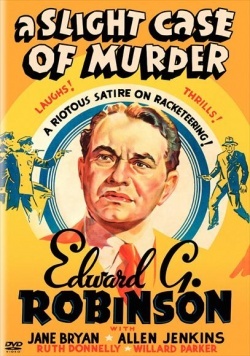 Edward G. Robinson has great fun spoofing his infamous gangster persona in this light-hearted Warner Brothers satire, based on a play by Damon Runyon and Harold Lindsay. In an extended plot device that defies all logic, Robinson’s tee-totalling crime boss Remy Marco is so feared by his minions — and apparently by the world at large — that not a soul is willing to tell him how truly awful his bootleg beer is. As a result, his post-Prohibition sales rapidly plummet over a period of several years, at which point Robinson — who has been eagerly embracing the opportunity to “go legit” and climb the social ladder — finds himself broke, but apparently not too broke to host a gala affair at his second house in the country, where all sorts of trouble ensues. It’s silly, innocuous fun, with plenty of Damon Runyon’s distinctive dialogue thrown in to move things along at a zany clip. Ruth Donnelly is drolly amusing as Robinson’s wife, who struggles to affect an air of distinction befitting her new station, while Robinson is simply delightful. This one’s worth a look. ~and don’t be surprised if you feel in the mood for a rewatch, almost immediately after. This screwball gangster comedy has so much going on in it (which is all fairly well laid out, so there’s no real confusion) that you may be tempted to revel a second time in how it’s all spliced together and intertwined. For those who happen upon ‘ASCOM’ (esp. without knowing much about it – it’s better that way), it’s a real find. The Runyon-based script could not be zippier and Lloyd Bacon’s direction could not be crispier (sorry). How could you not have flat-out fun being part of the shenanigans afoot here? It’s not that the story is just complicated – it’s delightfully detailed and the hilarious dialogue is more or less non-stop. ‘ASCOM’ plays appropriately like a bat out of hell and chances are you’ll be charmed to pieces. I had seen it before just now, some years ago, but I was quite pleased to revisit. A real winner!